I’ve talked about documentation management systems (DMS) and their value to a business in my article on PaperSave Plus. Today I’ll review another DMS system that works with QuickBooks: SmartVault. This product takes a different approach than PaperSave Plus – it stores your information in an online server rather than in a database on your local computer. In addition, you pay a monthly fee rather than making a one-time purchase. 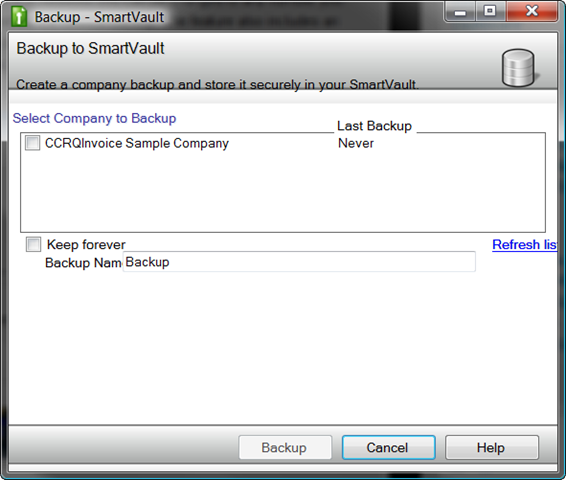 In addition to storing your documents you have the ability to store backups of your company file. There are a number of plans and options, I’ll just give an overview. You need to pay close attention to the details if you sign up. The standard plan is $19 per month. You can store up to 1000 documents and have one full access user (your accountant can access for free by signing up for an accountant’s plan, and any number of users can enter information into your in box). Beyond this you can add additional users at $5.00 per month, an additional 1000 documents for $10 per month, and storage space for backups at $5.00 per month per gigabyte. There are discounts for higher volumes. Note that you can install this and test it for one month for free, so you can get a feel for how it will work for you. Installation was a snap! You download an installation program from their web site and install it on each computer that will use the program. This takes just a few minutes. 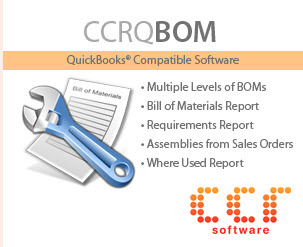 After installing you will run QuickBooks and register the program with your company file. 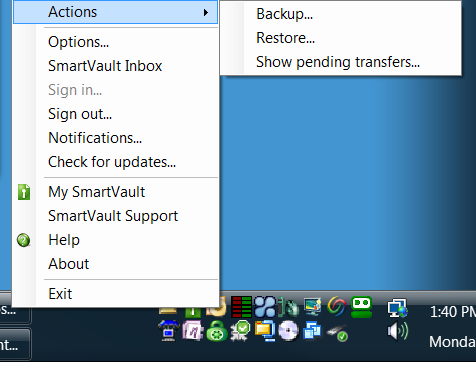 You will see a “sign in” icon in a toolbar added to the right, and a “SmartVault Inbox” icon on your desktop. 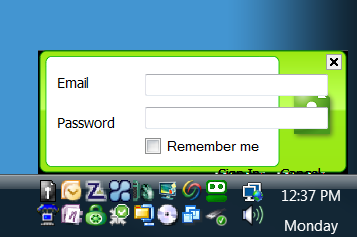 Click sign in and a window pops up in the Windows system tray. 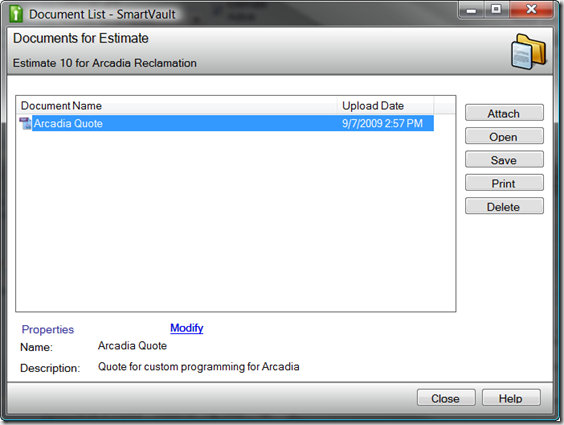 You will be asked to add the company to your SmartVault. 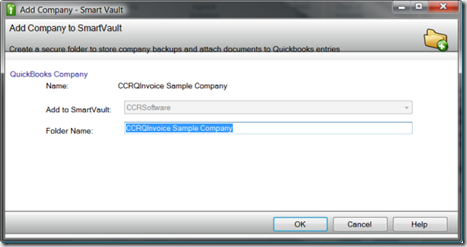 Now you are ready to attach documents to records and transactions in QuickBooks. Compared to PaperSave Plus this was very quick and simple. The paperclip icon lets you attach a document to the current record or transaction, via a scanner, file upload or a drag/drop from Outlook. The folder icon shows you if you have any attached documents, and allows you to view the attachments. 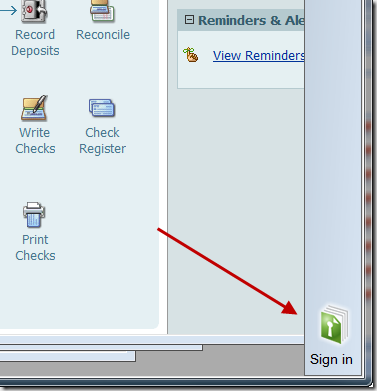 The note icon is used to attach a note to the current record or transaction. 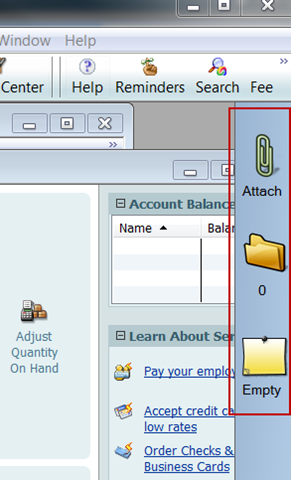 When you are viewing a record or transaction in QuickBooks you can click the paperclip icon to attach a document. The Inbox is a online repository of documents waiting to be attached. Other users can upload documents to the Inbox. Browse lets you locate and attach a document from your local file system. Scan will work with a TWAIN compliant scanner. Click scan and the document is immediately scanned – a preview will show on the right. You can enter a name and description for the document. The document has been updated to your online account. This happens very quickly and without any further input required from you. Note that if you do not have a current Internet connection the program will save the attachment as “pending” and you can save it to the database when you are connected later. You can add “notes” to any record or transaction. Clicking the Notes icon opens a simple text editing window. After attaching a note you will see a notification in the toolbar. The Inbox is a temporary storage place that will hold documents that haven’t been attached to a particular QuickBooks record or transaction. It can be accessed via the web or from a desktop icon. 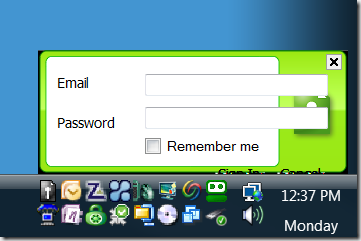 Note that you can install the Inbox on any computer, even one without QuickBooks, so that other users can send documents to be attached. Click Add to scan or load a document to the Inbox. 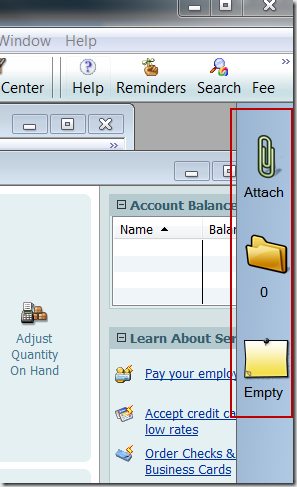 When you click the paperclip icon in QuickBooks you will be told that there are documents in the Inbox waiting to be attached. 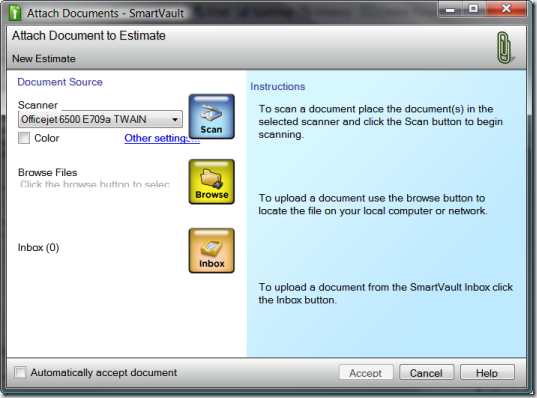 Unlike PaperSave Plus, SmartVault only integrates with Outlook 2003 and 2007. You cannot attach a document directly from Word or Excel. However, I found the Outlook integration to be very simple and straight forward. 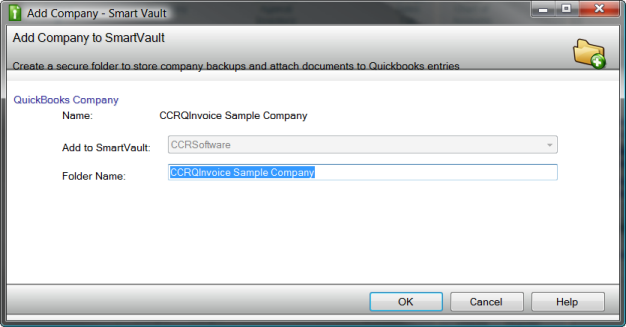 Simply drag the open Outlook email message to the SmartVault toolbar when you have the appropriate QuickBooks document open, and it will be attached. Another nice feature is that you can drag an attachment from an open email message onto the toolbar to attach that document. 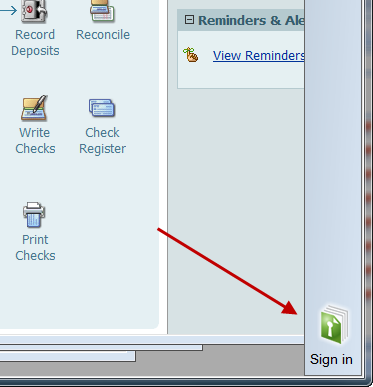 You can click on the folder icon to see all documents attached to the current record/transaction. From here you can attach additional documents, print or open the document, or save a copy locally. In addition you can log in to your Smart Vault through a web browser to view and manage your documents. This screen shows you what documents and notes you have for each company file you have registered. You can see the list of documents by category. I won’t go into detail here, but you have the ability to set up multiple users (for a fee per user) and you have a reasonable amount of control over what kinds of documents each user can access. Archive copies of your database. Backups of your QuickBooks company file. One of the drawbacks of using an online service to store important data is that you don’t have control of your data in case there is a catastrophe at the service provider, or you change your mind and decide to terminate the service. 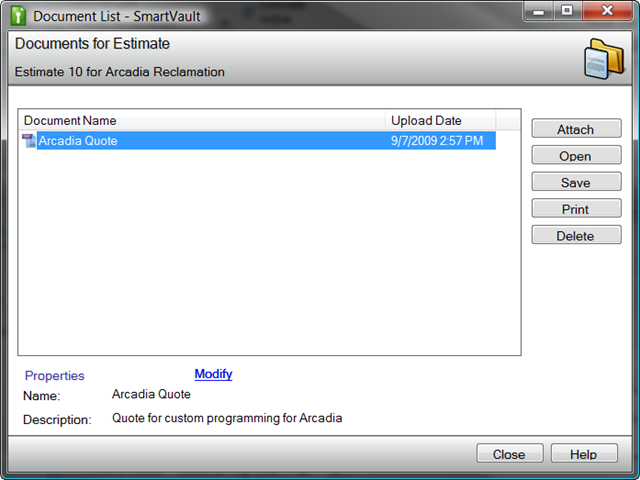 SmartVault addresses this very cleanly. You can order an archive copy of your database for a small fee. A zipped copy of your documents will be emailed to you. 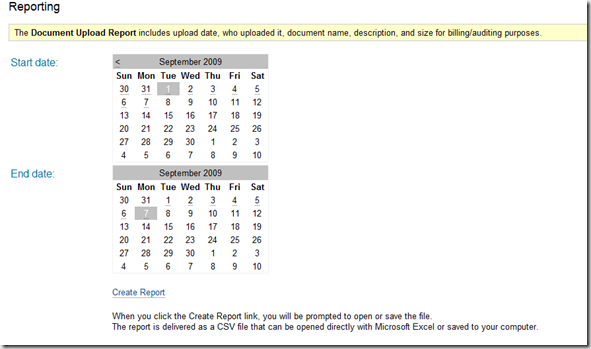 You can create a report that will show you the document name and description, date it was uploaded, and who uploaded the document. 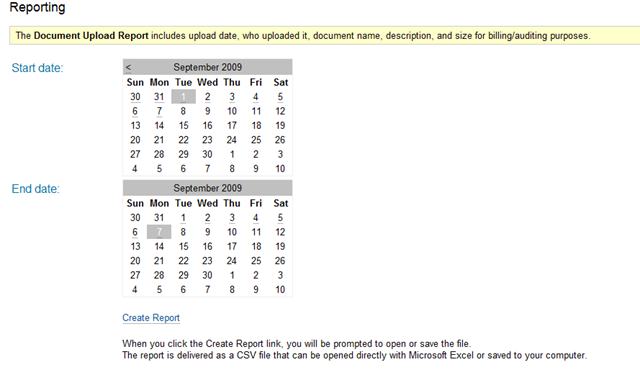 The report is delivered as a CSV file that can be opened directly with Microsoft Excel or saved to your computer. In my article on online backups I talked about the importance of having an off-site backup procedure as a part of your business security plan. 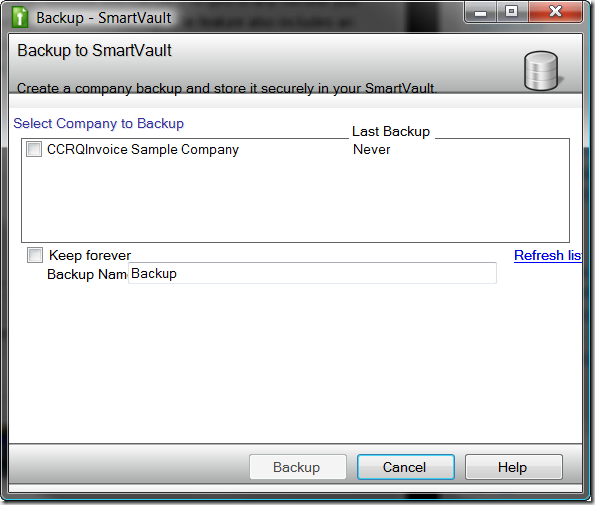 SmartVault provides you with a fairly easy to use backup feature that will store a backup of your QuickBooks company file in your SmartVault account. Note that you are charged for the storage space that you use. 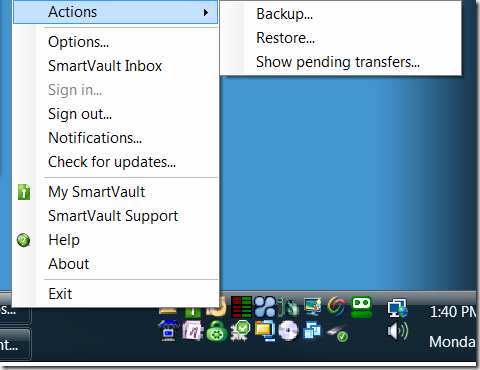 Backups are started from the actions menu in the SmartVault icon in your Windows system tray. Note that all users must be out of the company file or the backup cannot be performed. I’m not sure if this would be the way that I would handle my online backups, but if you don’t have another backup plan set up, this would work. I found that the program worked very smoothly, and was easy to use to save attachments. 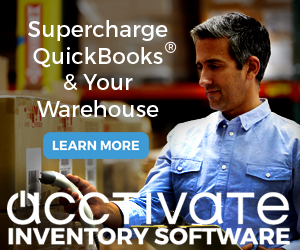 For my situation this worked better than PaperSave Plus because it didn’t pop up notices each time I saved a record or transaction in QuickBooks. Although the program isn’t tightly integrated with Microsoft Office, it does have a very simple drag/drop interface to attach email messages (or attachments) from Microsoft Outlook. If you don’t have an Internet connection you can still attach documents, and have them saved to the database later. The notes feature is very useful. The ability to retrieve an archive of your stored documents is an important and essential feature that every online DMS system should provide. I do wish that you could add documents to records other than what you have in QuickBooks so that I could use this for other kinds of programs. It would be nice to have a way to save documents from other Office programs such as Word and Excel. I’m concerned about the price of the product – pay as you go services like this can be expensive as you start to expand your use, and you either find that you are paying huge monthly costs or you are deciding to not store all of the documents that you would like to – a dangerous tradeoff. Did it work? Yes! Installation was simple, operating the program was simple, and there is a good selection of features. Operation is smooth, secure and very fast. 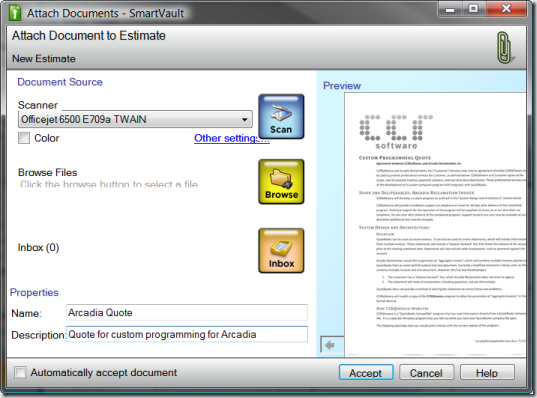 If you want this kind of off-line storage of documents, and the fees are acceptable, SmartVault is an excellent choice. 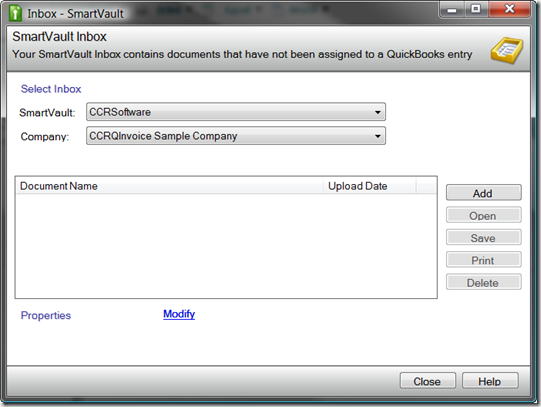 We have numerous clients using the SmartVault service with their CPAASP hosted QuickBooks, and they love it! Having the ability to access documents as well as QuickBooks from virtually anywhere makes it really useful for outsourced bookkeeping and accounting services, or even business owners who want the flexibility and security of a managed, remote access solution. 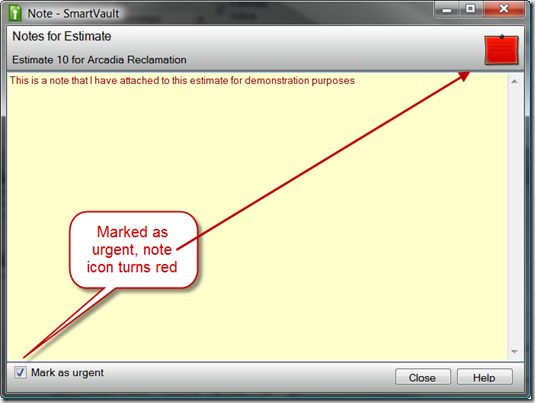 Excellent review confirming my decision to convert my clients to SmartVault. Thanks again for the complete & insightful review. 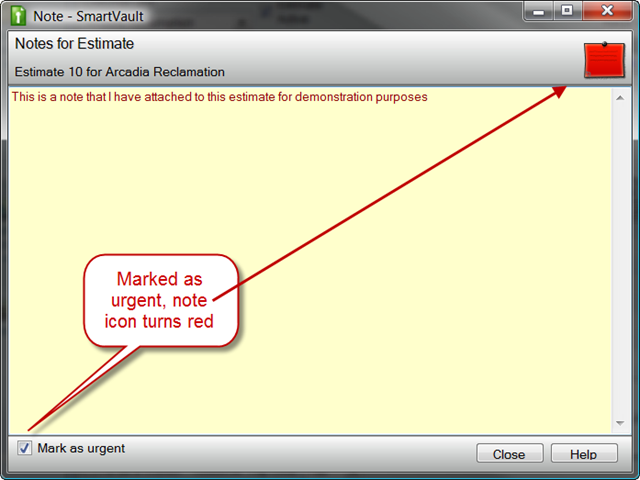 Using SmartVault just got a lot easier. 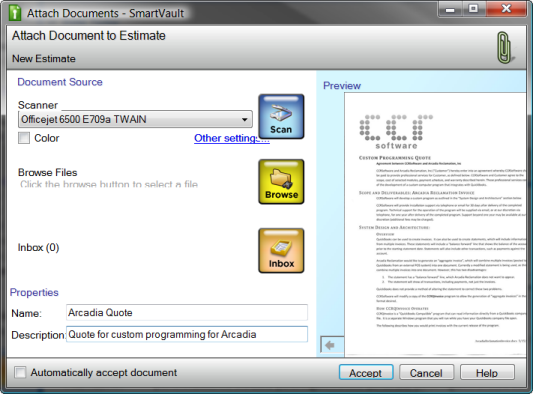 Employees can now fax or upload their own documents through Virtual Software (www.virtualsoftware.net) and accountants can review them before sending them directly to SmartVault and QuickBooks. 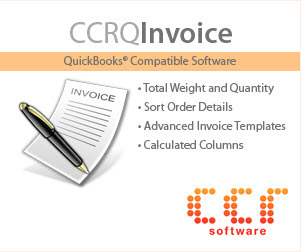 Accountants no longer need to scan documents. That’s a big time saver.